We carry a large stock of Mercedes 811D/709D midi coaches ranging in seating capacity from 22 - 33 seats. The vehicles are usually either from First Group or Stagecoach, and as such have been regularly maintained. Plaxton Beaver bodies; 4 litre turbo charged engine; automatic or manual gearbox; power operated door; hopper windows; luggage pen; separate drivers compartment. Available in either 31/33 bus seats or 32 high backed coach seats with 3 point belts. 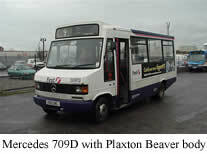 Plaxton Beaver bodies; 4 litre turbo charged engine; automatic or manual gearbox; power operated door; hopper windows; luggage pen; separate drivers compartment. Available in either 22/25 bus seats or 24 high backed coach seats with 3 point belts.